The Middle East is considered by many to be the heart of some of the most important religions and cultures in the world: Solomon’s Temple of the Hebrews is now the site of the Dome of the Rock Mosque, Christians make pilgrimages to the Holy Land, and young people of Jewish tradition visit Israel through the Taglit-Birthright initiative. Biblical traditions state that houses of prayer were to be open for all nations: “for mine house shall be called an house of prayer for all people” (Isa. 56:7). Can the religious and cultural traditions of the great faiths find inspiration in the ancient Temple of Solomon? Cedar tree as it appears on the Lebanese flag. The Phoenicians possessed architecture and construction skills and familiarity with building materials. They were expert engineers, and had already built a palace for King David, Solomon’s father. But when the temple was planned, vast numbers of laborers were needed. The Hebrews supplied the workforce, overseen by master builders from Tyre in a rotation system in which 30,000 workers were divided into three groups. Each group worked one month on/two months off. Therefore, as one work unit returned, another was ready; workers were always rested and fresh. Map of Phonecia and Israel with modern states, from National Geographic at nationalgeographic.com. Another feature of the rotation system was maintenance of the existing economy while developing a new one. Because each worker was away only one month at a time, families at home could maintain farm or business for a few weeks with little difficulty until the workers returned. Therefore, the local Hebrew economy continued uninterrupted, even as laborers were recruited from its population. As a bonus, because of the Phoenician/Hebrew workforce exchange, Israel acquired engineering and construction knowledge. Perhaps because of their exchange relationship, there was no recorded discord between the two countries in the shared region that today might benefit from increased cooperation. The Temple of Solomon may be one of the first known instances of prefabrication. In 1 Kings 6:7 it is stated, “And the house, when it was in building, was built of stone made ready before it was brought thither: so that there was neither hammer nor axe nor any tool of iron heard in the house, while it was in building.” The intent was to avoid disturbing the sacred place with the noise of hammering. Sections of the temple were prefabricated and installed on-site. Interestingly, Gustav Eiffel used a similar approach to building his iconic tower in Paris. The Eiffel Tower’s iron framework was crafted in a nearby factory, and then assembled and welded onsite by four-person teams who trained together, working in a carefully orchestrated assembly process. The French project, finished not only early, but on budget, had construction fatalities (although one gent died at a party while on weekend leave). 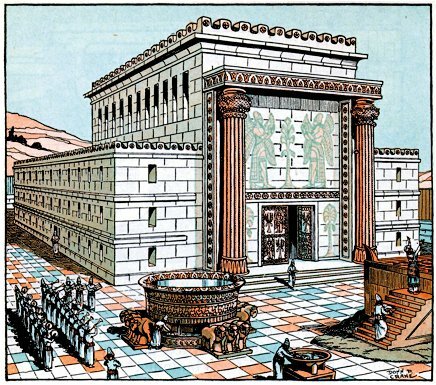 Solomon’s Temple was a “house of prayer for all people,” (Isa. 56:7) There are few instances of stated inclusion in the history of macro projects. Another is the Suez Canal whose “tariffs of dues for passage…shall be always equal for all nations.“ (Article VI, Firman of Concession, November 30 1854.) Did the Hebrews establish a tradition that can inspire the future? Solomon’s Temple is unique among ancient temples in that it did not have idols. This is significant because in that era, it was common practice to house idols in grand structures so spirits of the gods could enter and be present. The Phoenicians built temples. Egyptians too; in fact, Moses was educated in Egypt. But within Solomon’s Temple, in the Holy of Holies, instead of an idol, the Ark held the Covenant. For the first time in recorded history, the law, not an idol, was enshrined. Below is an excerpt from the King James Bible regarding construction of the Temple. My servants shall bring them down from Levanon unto the sea: and I will convey them by sea in floats unto the place that shalt appoint me, and will cause them to be discharged there, and thou shalt receive them: and thou shalt accomplish my desire, in giving food for my household. And king Solomon raised a levy out of all Israel: the levy was thirty thousand men. And he sent them to Lebanon ten thousand a month by courses; a month they were in Lebanon, and two months at home. -From the Bible, King James version, 1 Kings, chapter 5. Regions or Nations? : Solomon’s Temple suggests possibilities that emerge when resources are seen as regional, not national. For example, Phoenicians and Israelites worked together cooperatively to build the temple: expertise in construction (Phoenicians) was exchanged for know-how in agriculture (Israelites). Cedars and fir trees from one nation were the building materials for another. Workers from two different societies cross-trained, spreading knowledge to the entire region. How can we apply the model of exchange and cooperation seen in Solomon’s Temple to other regions of the world? Are there possibilities for NAFTA in which Mexico, the United States, and Canada can cooperate? What about the current Middle East? How about the Eurozone?